This photograph has been scaled down; full resolution photograph is available here (946 by 720 pixels). 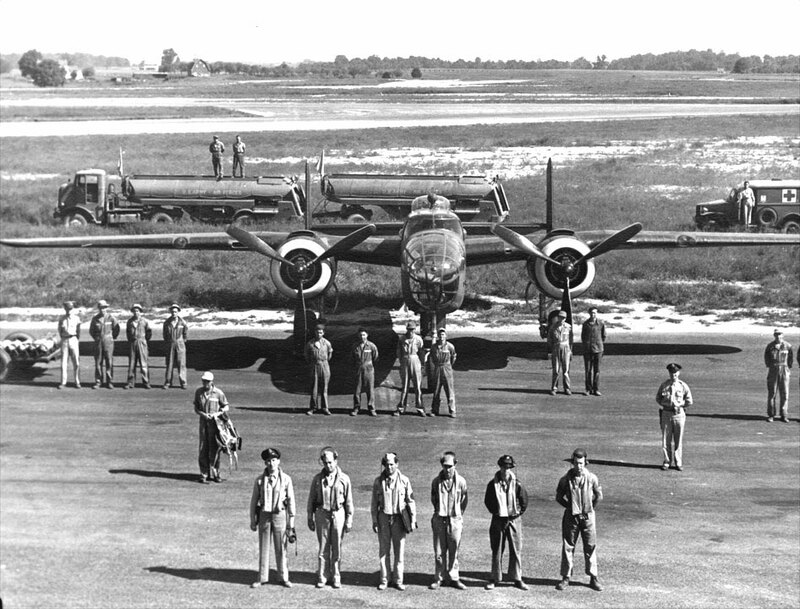 B-25 AND ITS SUPPORT: Looks like photo of B-25 Crew, but in this photo, we see six men and the usual crew of the bomber was Pilot, Co-Pilot, Bombardier, Radio Operator and Gunner. Could the sixth man be an Observer or the added tail gunner. Other personnel are the Crew chief and his Mechanics, Armorers, Ordnance men standing next to bombs, Parachute rigger, Airframe and other Specialists, Radio repair, Fuel service and Medical Service. Vehicle on the left, could be an Autocar 4 Ton Model U-7144 Tractor w/Fuel trailer, vehicle on the right is a Dodge WC-54, 3/4 Ton Ambulance.